Photograph of an old caravanserai at Ajanta in Maharashtra from the Curzon Collection: 'Caves of Ajunta in HH the Nizam's Dominions', taken by Deen Dayal in the 1890s. The old town of Ajanta is situated 8 km from to the south of the famous Buddhist cave temples which were excavated into the sides of a rocky horseshoe-shaped gorge around 200 BC and later in the 5th century AD. 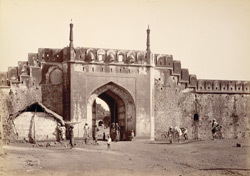 The town is surrounded by a strong fortified wall and moat built by the Nizam in 1727. This view shows an old caravanserai, a halting place for caravans.